New Jersey governor Chris Christie is reportedly no longer taking a weekend trip to New Hampshire to campaign for GOP presidential candidate Donald Trump. The cancellations in the battleground state come less than a day after two of his former allies were convicted in the Bridgegate scandal. 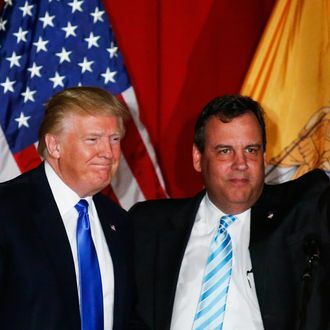 Christie was not charged in the plot, and he, once again, denied involvement in the political scheme after the verdict came down Friday — though, revelations from the trial indicate otherwise. Either way, it’s not the best look for a surrogate of a candidate whose top campaign theme revolves around locking up his political rival. Christie is leading Trump’s transition team — with the help of the governor’s close associates — and appears to still have his job. Trump campaign manager Kellyanne Conway told CNN Friday that Trump and Christie hadn’t talked after the verdict. “All of our personnel remains the same,” she said.